The recent right-wing coup attempt in Ecuador shed light on the rupture between President Rafael Correa and the country’s indigenous movements. This rocky relationship demonstrates the challenges of protesting against a leftist leader without empowering the right. When Correa took office in January of 2007, he moved forward on campaign promises including creating an assembly to rewrite the country’s constitution, using oil wealth for national development, and confronting US imperialism. 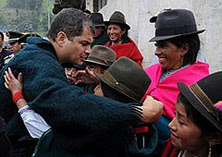 However, once the electoral confetti stopped falling, Correa began to betray the indigenous movements’ trust on many fronts, pushing for neoliberal policies, criminalizing protests against his administration and blocking indigenous movements’ input in the development of extractive industries and the re-writing of the constitution. Indigenous movements protested a right wing coup attempt on September 30th while criticizing the negative policies of Correa, a president widely considered a member of Latin America’s new left who is working to implement modern democratic socialism. How did it come to this? The history of the dance between Correa and the indigenous movements offers insight into the current political crisis in the country.